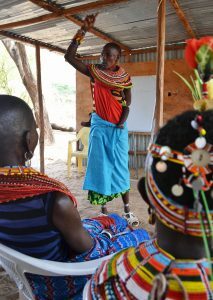 SAIDIA runs workshops for women’s participation in devolved governance. 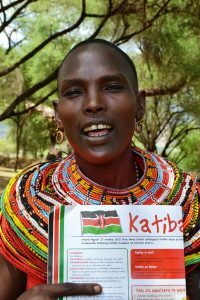 This program supports the intent of Kenya’s constitution that women be genuinely and equitably involved in legislative, budgetary and administrative decisions that directly affect them and their families. 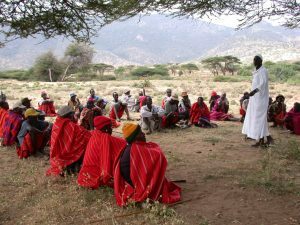 SAIDIA works in four counties – Laikipia, Isiolo, Marsabit and Samburu – where cultural norms have impeded women’s ability to be active in politics and decision-making bodies. For instance, custom dictates women have no voice in public forums. SAIDIA educates women and men on women’s rights with a view to women standing for elective positions, particularly in county government. Women learn about their constitutional rights and how they are safeguarded by Kenya’s legal framework. They discuss gender equality, cultural expectations and why it is important to be involved in county politics. They do exercises on how to conduct a campaign to run for public office, public speaking, personal presentation, and dealing with the media. The workshops have an immediate impact on participants’ lives and how they view themselves. In a striking departure from the historical norm, councils of elders have agreed to allow women to speak at public meetings for the first time ever. Women are included in county committees and run for elective county office. All participants have requested further training on budget tracking (County Development Funds and the annual county budget), on land issues, more on women’s rights, on civil society participation in political processes and how to become part of the county legislative process. The follow-up meetings have revealed outcomes such as a reduction in the incidence of domestic violence and an increase in girls’ school enrolment. Women challenged Maendeleo ya Wanawake election results in court. In Isiolo women protested they had not been included in the budget allocation consultations with the result that the budget did not go to reading to allow for women to be included in the process. Group ranches amended their constitution to provide for issues affecting women. As part of the education programmes SAIDIA has occasionally run health education themed workshops for community members.